It’s a scorcher of a day. Sun shining and sky soaked in a brilliant blue. It seems almost sinful to be sitting indoors watching movies…when we could be outdoors where there are luxury yachts and happy bathers bobbing about on the Mediterranean. But c’est la vie…and it’s a glorious vie! Tip One was to arrive early because the looooong queue we were in was nothing compared to how long it normally is. Tip Two was to never sit next to Italian journalists in the movies because they don’t stop talking…and loudly! 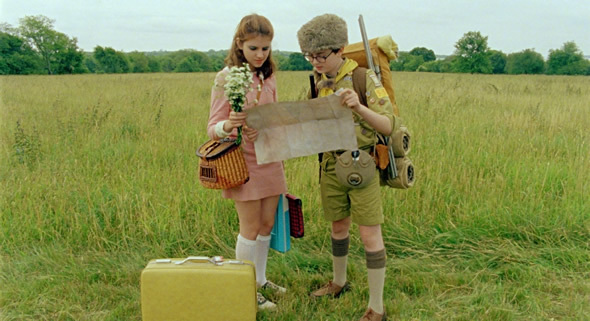 So, sitting between a German and a Japanese journalist, I watched Wes Anderson’s ‘Moonrise Kingdom’. It’s a beautiful whimsical tale about love – young love and old love, and how we all need to be loved. It’s like watching a wonderful piece of art work in motion – everything’s so magnificently placed in the film, even the tilt of people’s heads in a crowded church. And the music is fantastic. Orchestra. French. The sounds match the vision. The film stars Bruce Willis who plays a cop on a small island. It’s a role so different to anything you’ve seen Willis in before…and he plays it with tenderness (apart from a brief ‘Die Hard’ moment near the end). And then there’s the crazily talented Frances McDormand, Bill Murray and Ed Norton (who plays a scout master who ‘loses’ one of his scouts).